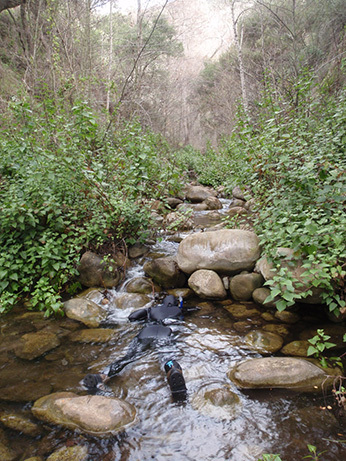 The Carpinteria Creek watershed in Santa Barbara County has been the focus of habitat restoration in recent years for federally endangered steelhead trout (Figure 1). This restoration will aid steelhead trout in their upstream migration by allowing them to access previously blocked spawning and rearing grounds. 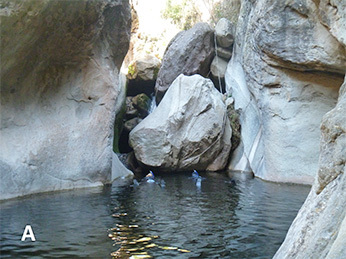 This watershed, which includes Carpinteria and Gobernador creeks, was designated as highest priority for recovery by the National Marine Fisheries Service. As a result of restoration efforts, the California Department of Fish and Wildlife (CDFW) has been conducting ongoing habitat and steelhead trout population monitoring. Monitoring during the severe drought of 2013/2014 helps scientists understand how effectively Gobernador Creek can support steelhead trout migrations, spawning, and rearing during extreme habitat conditions. 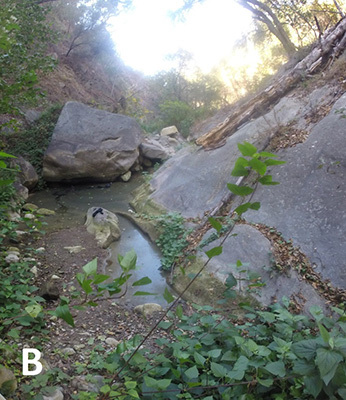 CDFW surveyed a section of Gobernador Creek three times during 2012 and 2014: in February 2012 (fish surveys); February 2014 (habitat surveys); and in November 2014 (both fish and habitat surveys) (Figure 2). Surveys were conducted by CDFW environmental scientists and staff from a local non-profit organization, South Coast Habitat Restoration, which implements the habitat restoration projects in the Carpinteria Watershed. South Coast Habitat Restoration also plays an important role in communicating the field efforts with landowners to request permission to access to the creek. 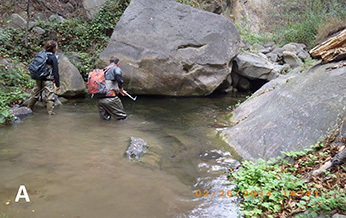 In February 2012, a snorkel survey was conducted in Gobernador Creek to count the number of steelhead trout (Figure 3). During that survey, 563 steelhead trout, ranging in length from 2 inches to 12 inches, were documented along a 1.6 mile stretch of the creek. Two years later, a survey crew returned to measure the habitat in the same section of Gobernador Creek. In that survey, they documented 1.2 miles of wetted channel and only one dry stretch, which was less than 200 feet long. 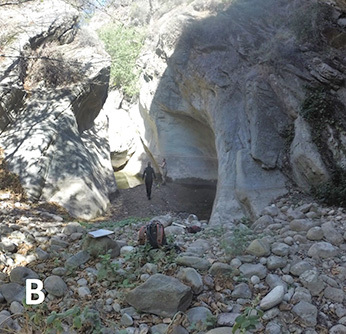 Recently (in November 2014), a team returned to Gobernador Creek to conduct snorkel and habitat surveys, counting the number of steelhead trout present and assessing the extent of the drought’s effects on the amount of available habitat (Figure 4). The results were a stark contrast to what had been seen in earlier surveys: of the 1.6 mile survey reach, less than 100 feet of stream had enough water to snorkel (water needs to be a minimum of one foot deep to allow for snorkeling); the rest of the stream had gone dry. Only eight fish were observed, and ranged in length between 2 and 8” (Figure 5). CDFW will continue to monitor the Carpinteria Creek watershed starting with this winter. If flows allow, we will be placing a dual-frequency identification sonar camera (called a “DIDSON”) in Carpinteria Creek to count the number of adult steelhead trout returning from the ocean to spawn in the creek. This sonar camera can “see” fish, during both day and night as well as during cloudy water conditions after rain events. CDFW will again conduct two snorkel surveys (once in the spring and once in the fall) to determine the percent of steelhead trout that survive through the summer. Habitat will be measured as well to assess how much of the creek remains wetted. Through these monitoring efforts on the Carpinteria Creek watershed, we will better understand the effects of the drought on steelhead trout populations during times of drought. We are hopeful for rain and the resiliency of the steelhead trout population.